Portrait time for the new book came and went. My husband of 38 years was the photographer this time around. It's kind of nice having someone in the family who knows his way around a camera, because he lets me proof each shot as he takes them, and I get to have the final say about which one gets printed. See what you think of the one I picked out. 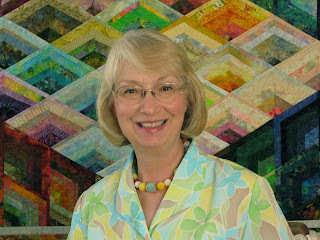 The past week has been a whirlwind of activities quilt-related and some not. Step-outs for a new class occupied most of my quilting time, and once the rain stopped, the lawn and garden took up the rest. And walking and dieting, too, because my clothes from last summer simply won't stretch far enough to cover this upcoming summer's body. Now, how did that happen? This week, I'm working on the step-outs for a new class that I'll be teaching for the first time next month in Tenne ssee: Cubic Stars. 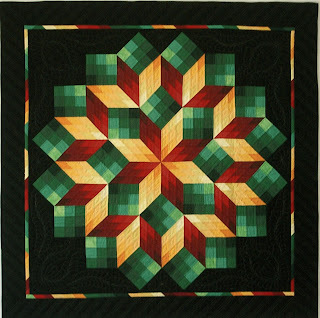 The original quilt is made from all solid colored fabrics in lots of different shades of 3 different colors. Wouldn't you know it? Those fabrics just can't be found anymore, so I had to make a trip t o my local quilt shop. Country Dumplings is in Cimmarron, Kansas. 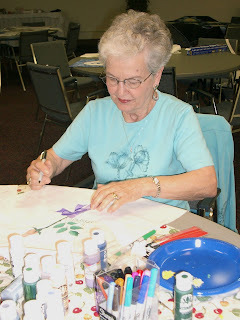 Betty Mae Jantz, the shop owner and my friend, worked very hard to help me find commercial prints for my project. 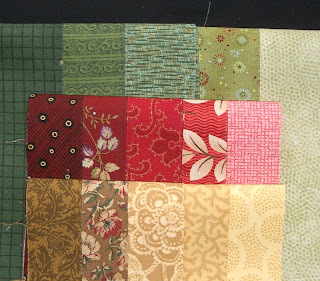 I had such fun pulling Fat Quarters off the shelves and laying them out to find just the right values and colors in prints that 'read' as solids for this project. 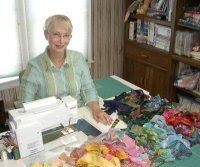 I'm not sure Betty Mae had as much fun putting all the pieces away afterward, but now I have a wonderful selection of new fabrics to play with. Take a look for yourself. One of my biggest problems with making class step-outs is that I never want to stop. When I see how beautiful the pieces begin to come together on the design wall, I want to continue working until th e whole thing is sewn together. But finishing it defeats the purpose for making the step-outs. 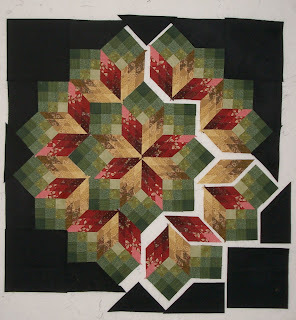 I need the unfinished pieces and parts of the quilt to demonstrate the steps needed to make it. This always leaves me with an uneasy, dissatisfied feeling. There is no closure. I keep telling myself that the day will come when I can finish all those UnFinished Objects, but only after I've taught the class a few times. Here are the finished step-outs for Cubic Stars. Can't you almost envision how the entire thing will go together? 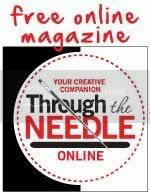 Who needs a written pattern when you 've got a good visual example in front of you? I think that's the whole idea of making these samples, isn't it? 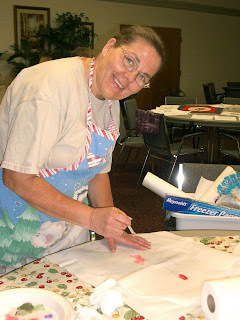 Other things going on in my life over the past couple of weeks included teaching 2 small Saturday workshops for my quilt club, Miss Kitty's Quilters. 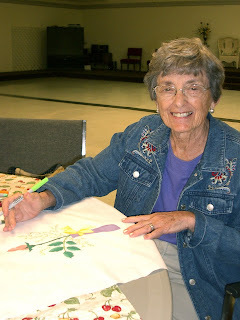 The first was about making string-pieced applique, aka Plaid Poppies. 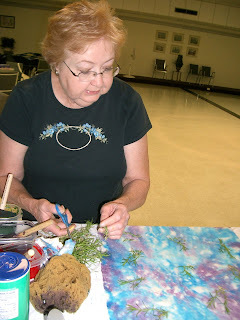 My friend Deb Brown was inspired by her border fabric to make Purple Cone Flowers instead. 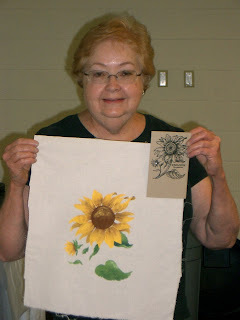 This past Saturday, we had fun stenciling flowers on fabric, and doing some sun printing without the sun! It rained, so our fabrics were more like 'flourescent light' printed instead. It worked! Yup, they sure do! Love teaching classes for those smiles! Is there any chance I can purchase this pattern? I would love to make it.